Sue Barnes | Resource Financial Planning, Inc.
Sue Barnes, Vice President of Resource Financial Planning, Inc., was born and raised in Portland. After graduating from the University of Oregon, Sue entered the management training program at General Electric Financial Services, and went on to hold management positions at GE, PacifiCorp Financial Services and AT & T Commercial Finance. 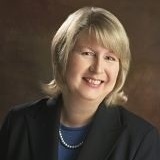 In 1992, Sue decided to apply her financial experience to helping individuals achieve their life's goals, and joined Resource Financial Planning, Inc. She holds a Series 7 general securities, Series 63 Securities Agent State Law , and 65 Investment Advisory representative registrations. She is also life, health and variable insurance licensed. Sue has been recognized by her national broker-dealer firm as one of their top advisors in the country**. Her passion is seeing her clients thrive and reach their dreams of retirement and higher education for their children. Sue is a respected speaker and, with other firm members, teaches financial planning classes that help people understand the financial planning process and make better financial decisions. She serves as an adjunct faculty member at PCC, teaching adult financial education courses. Sue and her husband are empty-nesters, with a grown son, and two cats to help fill the void. She enjoys going to the theater, traveling, quilting and keeping up with the ever-changing financial landscape, tax laws and planning technology and techniques. ** based upon sales generated. The award is not based upon performance or returns experienced by any client or opinions of the advisor’s clients or former clients.